Thanksgiving came and went but perhaps you still have some leftover in the freezer like I do. Not to worry as frozen turkey is good meat and there are many things you can use it in. This delicious Turkey Pot Pie is one of them. I like to wait a bit after the big turkey dinner to make something else with the leftover so that the family does not get an over dose of turkey. It is amazing how much better they like it one or two weeks down the road. Now, back to that turkey. I hope you did save the turkey carcass and bones after removing all that meat. Back in the old days, I would portion out the bones and freeze them. Not any more. These days, I immediately throw them into a huge pot with water and boil them for a couple of hours to extract all their goodness. Then I would strain the stock and put them into containers. I find that it works better this way because I would have stock or broth ready to go. 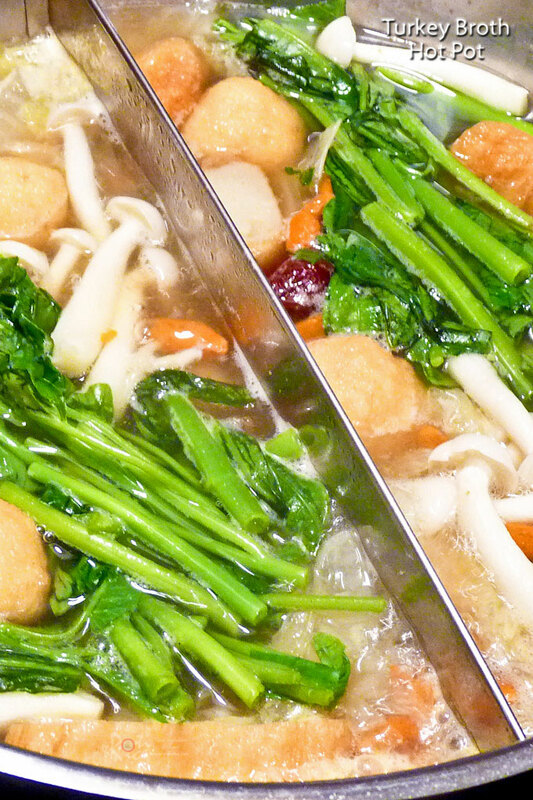 That brings us to today’s Turkey Broth Hot Pot. I actually made this two days after Thanksgiving while my sons were still home for the holiday. It’s been a while since we sat down to a hot pot meal and it was a good excuse to do it again. I was going to flavor the other half of the broth with tom yum paste but no one was keen for spicy soup except me. No biggie! I just filled both sections with the same broth. To make mine spicy, I simply added a teaspoon of garlic chili sauce into my bowl of goodies. The soup was already so tasty and so that was an easy fix. I could also have used the tom yum paste if I wanted to. It would have been just as delicious. 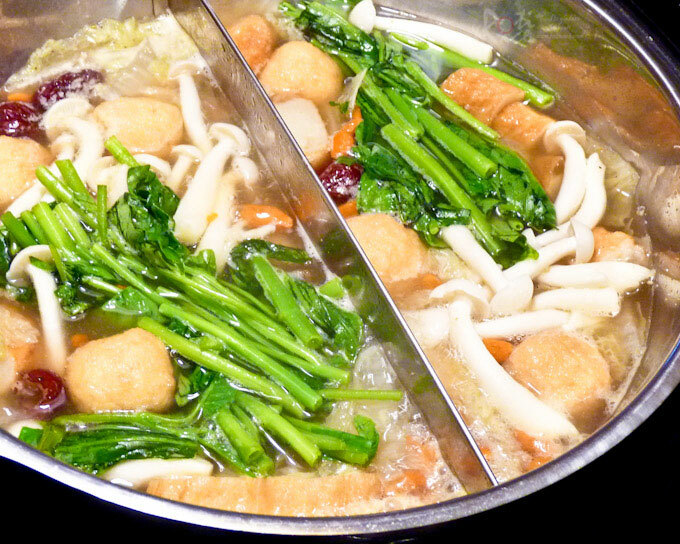 Winter is surely upon us now and a hot pot meal is what we all need. It is warm, delicious, and comforting. Best of all, it is so easy to prepare. You may need to do a little bit of prep work but cooking is kept to a minimum. Many of the dipping ingredients can be prepackaged ready-to-cook stuff found at the Asian markets. You can even add a variety of tofu and dumplings if desired. I simply used what I had in the refrigerator and freezer. 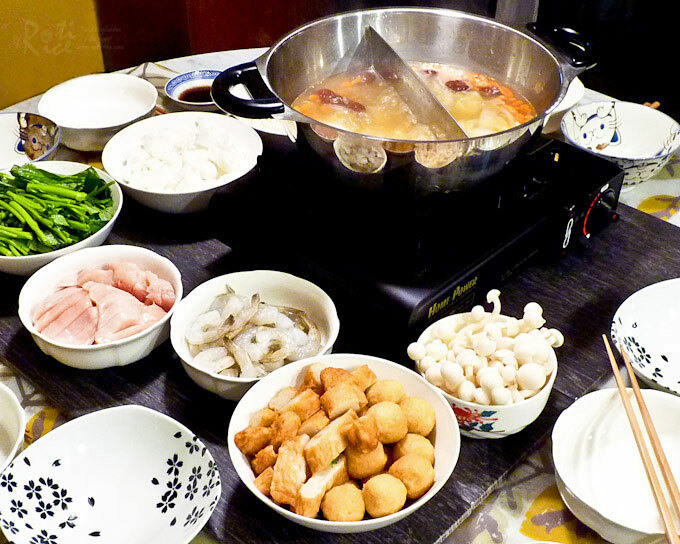 For more ideas, please check out my Chinese Hot Pot post. 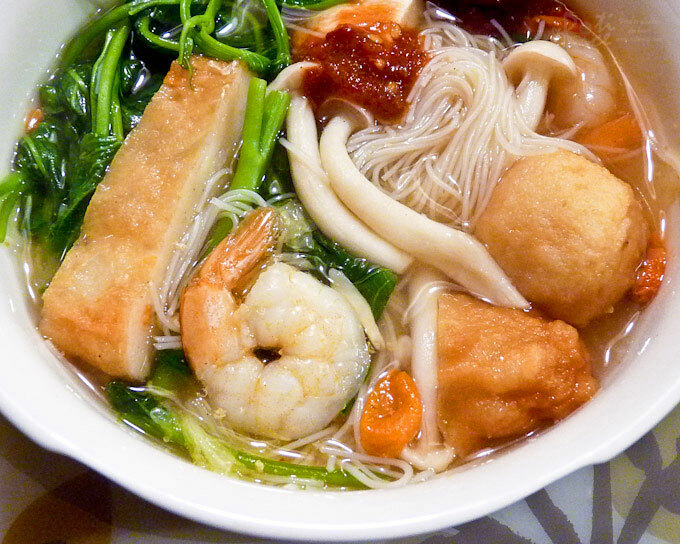 Please also note that except for the broth, no measurements of the other ingredients are given because you can prepare as much or as little as you wish. I hope you will give it a try. Bring water in a large pot to a boil. Add turkey carcass. Reduce heat to low and simmer for 1½ hours. Skim off scum appearing on the surface. Remove turkey carcass with a slotted spoon and strain the broth with a metal strainer. Add Napa cabbage and goji berries. Lower heat and simmer for 10 minutes until Napa cabbage is very soft. Season with salt and pepper. Turn off heat. If you are using fresh rice rolls and assorted fish cakes, prepare a steamer and steam rice rolls for 5 minutes to soften and heat through. Then, scald assorted fish cakes to remove excessive oil. Remove fish cakes and cut into smaller pieces. Set a bowl, small wire strainer, and dipping sauces for each place setting. Transfer broth to a dedicated or electric fondue pot until about half full. Do not over fill as food will be added to the broth at the table. Set the fondue pot on a portable stove or plug it on at the table. Arrange all other ingredients into different bowls around the electric pot at the table. Bring turkey broth to a boil. Add small portions of desired ingredients into broth and simmer until cook. Dish into individual serving bowls with slotted spoon or small wire strainer. Dip cooked food into sauces and enjoy. I recently found fresh rice rolls at one of our local Asian markets. Since then I have been keeping a supply of it in my freezer. 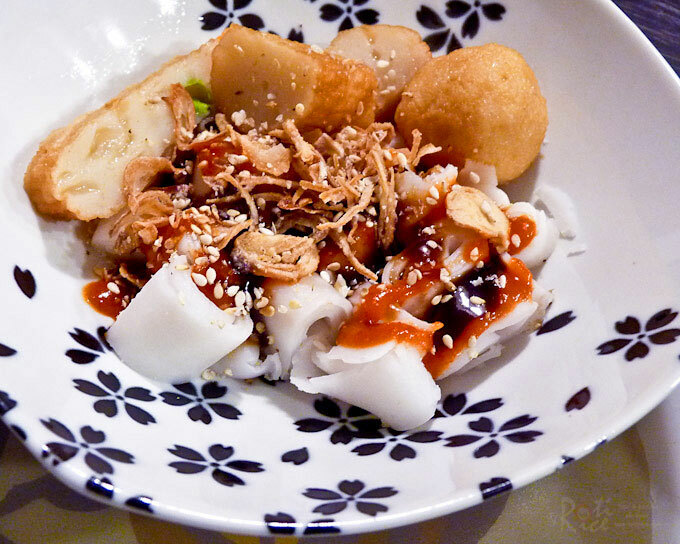 Fresh rice rolls are eaten dry with sauce like this KL Style Chee Cheong Fun which I shared not too long ago on my other blog, Malaysian Chinese Kitchen. Do check it out. That’s exactly what I had planned for Christmas, remembering the “Steamboat” in Singapore. Oh yes…our beloved “steamboat”! 🙂 A steamboat for Christmas sounds like a wonderful idea. We did it once some years back. A lot of fun.